The default WooCommerce installation usually shows 3 to 4 products per row and about 10 products per page. Unfortunately, there are no WooCommerce settings to change the number of products per row or the number of products per page. The WooCommerce Product Archive Customiser plugin makes it very easy to Change Number of WooCommerce Products Per Row and Page. The following procedure explains how to change the number of WooCommerce products per row and products per page using the WooCommerce Product Archive Customiser. 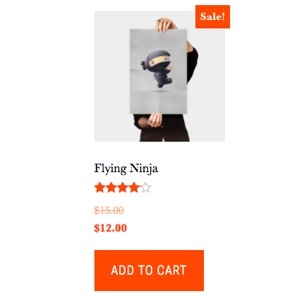 In addition, you can change many other WooCommerce product archive settings with this plugin; for example, you can show or hide add to cart button, sale badge, product image, product price, and more. Note: The plugin author notes that WooCommerce Product Archive Customiser doesn’t work with all templates. For example, your template might already have custom WooCommerce code that overrides the settings in this plugin. I tested this plugin using the following templates: twentyseventeen, WooCommerce storefront, and genesis templates and it worked on all of them. If this plugin does not work for you, you will probably have to find the code in the template that sets these features and change it there. Download Install the WooCommerce Product Archive Customiser plugin. How to install WordPress plugins. Once the WooCommerce Product Archive Customiser plugin is installed and activated, go to Customizer > Product Archives. 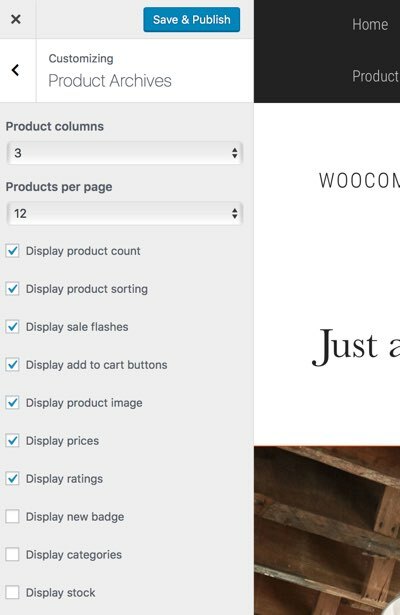 Use the Product columns and Products per page list to adjust the number of WooCommerce products per row and products per page that will display on product archive and product category pages. Click Save and Publish to apply the WooCommerce product archive settings. Test the product archive pages to verify that your changes are applied.